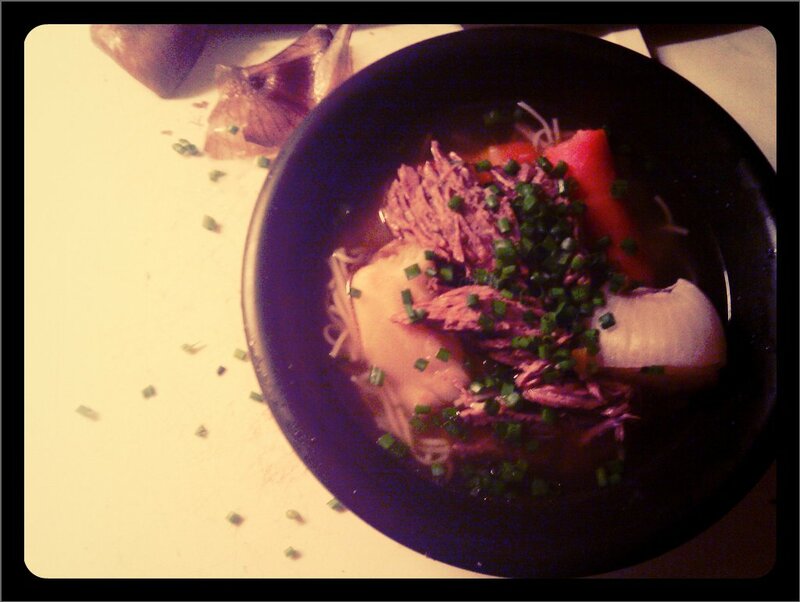 This is Viennese Beef soup. It’s a great kind of soup for whenever you’re in the mood for some beef. And soup. It’s easy to make, requires only an onion, a few carrots, celery, leek, parsley, a few bones and some beef. To top it off, chives. Cut the onion in half, place it in a large, heated pot, face down, until it’s dark. Very dark. Then add rinsed beef, bones and copious amounts of cold water. Bring it to a boil, in the course of which you’ll want to skim the brown froth collecting at the top. When no froth is collecting anymore, add the carrots, celery and some peppercorns. Then let this thing boil at low heat for a while. And by while I mean about three to four hours. If you’re like me, you can also add a couple of soup cubes. Just to make sure, you know. Half an hour before serving, add leek and parsley, remove the bones, cut the beef in easy pieces and throw it back in. Add whatever you want for substance (I use Vermicelli), sprinkle with fresh chives when serving. And that, my friends, is it.